Valdosta has two wastewater treatment plants. The Mud Creek Wastewater Treatment Plant (WWTP) built in 1979 and upgraded in 2012 to a capacity of 3.22 million gallons a day (MGD). The other plant, the Withlacoochee WWTP was rebuilt in 2016. It has a wastewater treatment capacity of 12 MGD. See: City of Valdosta WWTPs. According to information received from Valdosta, the Withlacoochee WWTP cost $23 million. The Force Main Project, which includes the construction of a 6.2-mile force main, four new lift stations, a new headworks structure for the new WWTP, and a 6-million-gallon equalization basin cost another $37 million. During the December rain event our sewer plant operated perfectly, the way it was designed to operate. We operate with a capacity of 3.5 MGD. During the storm we were getting 30 to 35 to 37 MGD on that day. We hit capacity and we didn't have anywhere for the water to go. Since that time we dug a temporary 8 mil gal retention pond and are getting the proper permits. We also put in a SCADA system which allows the plants to communicate with the lift station, so we will know when the water is coming. We've done a lot on our end. We are told that the December rain was a 100 year event. We don't normally get 13 inches of rain in a 24 hour period. I think they estimated about 8 billion gallons of water fell in the area. Like most cities, including Lake City, storm water and wastewater infrastructure is aging or ancient. Leaking old clay pipes and water infiltration is nothing new and a chronic and expensive problem to fix. 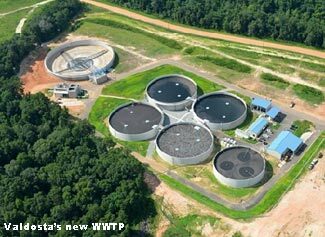 With two new wastewater treatment plants and over $60 mil invested in the plants and upgrades, Valdosta seems to be working hard to fix the problems. "We have aging infrastructure. Storm water is infiltrating into the system. We have crews out looking to find where the water is infiltrating the system. We've got 4,000 manholes, 200 different river crossings. We have to figure out where that water is coming from... We have fixed our lift stations. It is just that once we get it to the plant we don't have enough storage on site. If we could eliminate storm water from coming into our system, then we would be in good shape." Why are folks in Florida unhappy? 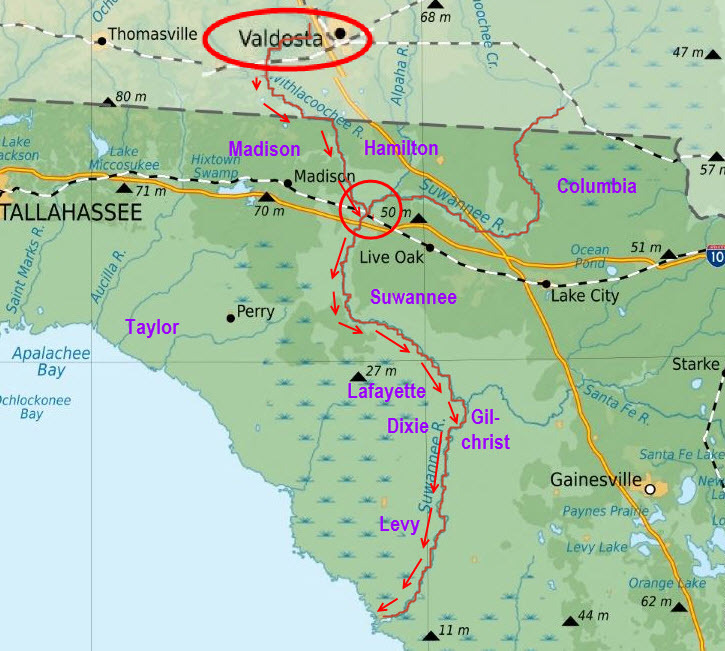 According to figures provided by the North Central Florida Planning Council, between March 2009 and August 2018 Valdosta spilled almost 78,000,000 gallons of raw sewage and storm water into the Withlacoochee River, which floated south into Florida past Hamilton, Madison, Suwannee, Lafayette, Gilchrist, Dixie, and Levy counties. Com. Rick Davis wanted cooperation, not litigation. 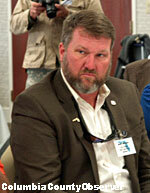 Madison County Commissioner Rick Davis is the Chair of the River Taskforce. He explained that he and others had met with Valdosta on December 21, 2018, and that an issue with Valdosta was "timely notification" of spills. "Their definition of timely notification didn't coincide with what our definition of timely notification is. They said they must report to their environmental protection department any spill over 10,000 gallons within 24 hrs. They said, 'They report em' all.'" Commissioner Davis continued, "I think the consensus of that meeting was that their city manager would notify Brian [Brian Kauffman: Madison County Coordinator] upon an event happening. In my opinion, that's a Band-Aid, but that is not a solution." Dan Hartley, Rep. Brannon's Legislative Secretary, kept Mr. Brannan up to speed in real time. Scott Koons, Executive Director of the North Central Florida Regional Planning Council (NCFRPC), added that over the last 8 or 10 years the City of Valdosta has spent over $100 mil and over the next ten years Valdosta is scheduled to spend $161 mil dollars in additional improvements to its wastewater infrastructure. Chairman Davis said he was looking to help Valdosta get state and federal money. He said, "How can our state legislature and federal elected officials help the City of Valdosta get funding to remedy this situation. If you erase the state lines, everybody is affected by that river... There shouldn't be any state lines when it comes to environmental and health issues." "We're being used as a septic tank"
Com. John Meeks thought Levy County was getting the short end of the stick. Levy County Commissioner John Meeks added: "We need to reach out to the Governor's Office and encourage him to follow the lead of what Governor Scott did with the problems they were having in Apalachicola Bay with the Chattahoochee River... and Georgia killed the oyster industry. Where I'm at and where Commissioner Higginbotham [Dixie County] is at, we're at the bottom end of this... a ten year time line is not the answer for me... We're letting the neighboring state use us as a septic tank -- somebody needs to step up." Gilchrist County Commissioner Kenrick Thomas asked, "When you met with Valdosta and everybody up there did you think you made any influence on them, or do you feel like they were wantin' you to leave?" Chairman Davis began to respond, "I left out of there with a little better" (Madison County Coordinator Brian Kauffman cut him off). However, they appeared to have the same view. Mr. Kauffman: "I felt like they genuinely cared, but they only have so much money." Commissioner Thomas followed up, "Did they acknowledge that and say 'yes' they want your help?" Mr. Kauffman: "Yes they did. I think we can do a better partnership with them." Commissioner Thomas: "I think if Valdosta wants our help we're on the right track." Spills: "How do we find out?" Commissioner Meeks suggested that Valdosta alert all the counties along the line in the event of a spill, mentioning that it is not hard to put everyone on an email list. Com. Beth Burnam recommended a good will trip to Valdosta. Commissioner Beth Burnam of Hamilton County said it is frustrating for everyone that they find out about spills on the news or social media before they hear from Valdosta. A little while later Commissioner Burnam added, "I'm very hopeful with representative Brannan that he is lending us his ear, because I've been very disappointed in the previous six years in the amount of attention that was paid to what we said." Dan Hartley, Representative Brannan's legislative secretary said, "He just sent me a text and he is very concerned about this." Commissioner Meeks accentuated his frustration, "This is somebody else's problem that is being flushed down on us." Com. 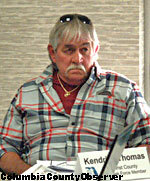 Ronald Williams spoke about an injunction. Commissioner Burnam recommended a good will trip to the City Council of Valdosta. Chairman Davis said, "I think that's a great idea. I am not looking to have an adversarial relationship, but a partnership." Commissioner Burnam followed up, "I think that would send a good message to them." Columbia County's Commissioner Ronald Williams said, "We can prepare to file an injunction to present the evidence to a judge. I think it's something we should work on." Com Kendric Thomas: not in favor of litigation. Commissioner Thomas warned about lawsuits, "I think if we start the relationship you want to start with Valdosta - you can throw that out the door." Chairman Davis agreed, "That's our last option." The Taskforce agreed to go to Valdosta to introduce themselves. 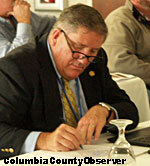 Chairman Davis announced that the next meeting of the Taskforce is February 28, 4 PM, at the Holiday Inn in Lake City. 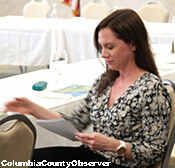 Columbia County Tourism Director Paula Vann flips through the meeting agenda. 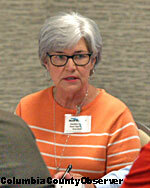 Columbia County Tourist Development Director Paula Vann stopped by the Taskforce meeting. Besides being involved in Columbia County tourism, Ms. Vann is involved in tourism throughout the North Florida region and is concerned about the health of the region's rivers and springs. After the meeting Ms. Vann texted the following statement: "The Suwannee River has been an economic engine for North Florida for hundreds of years. Its integrity is at risk, and this task force is vital to help fight for both the Suwannee and Withlacoochee Rivers and our tourism rich economy."